Authorities are looking for a mother who they believe abandoned her newborn baby at Tucson International Airport with a handwritten note pleading, "I just want what is best for him and it is not me." The woman, seen on security footage carrying something wrapped in a blanket and walking with an awkward gait, may have given birth in an airport bathroom in Tucson, Arizona, before leaving the child on a changing table at a family changing room with a handwritten note, Los Angeles ABC station KABC reported. 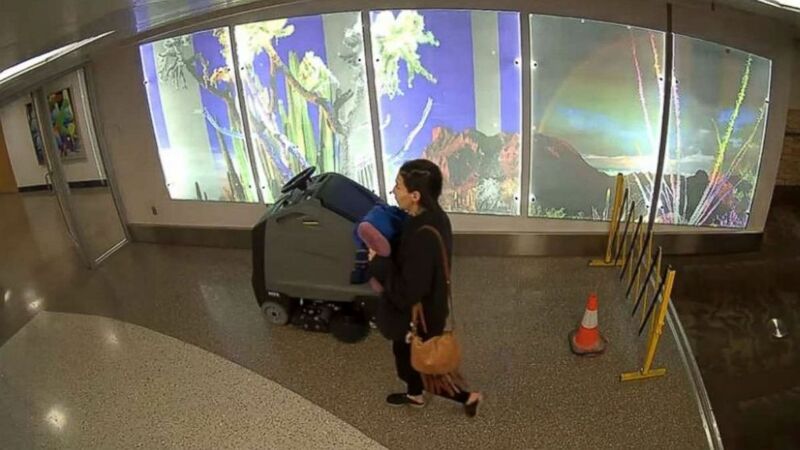 The Tucson Airport Authority released footage this week of the woman walking through the airport when the baby was abandoned on Jan. 14, and are looking to find out who she is. The note left with the child read, "Please help me. My mom had no idea she was pregnant. She is unable and unfit to take care of me. Please get me to the authorities so they can find a good home. "I just want what is best for him and it's not me," the note adds. Airport security received a 911 call from someone who discovered the baby at the changing table near baggage claim, according to KABC, and they immediately began investigating. The child was in good condition, authorities said. The Washington Post reported airport officials found bloody clothes in an airport bathroom they believe belong to the woman.